It is a tremendous disservice to relegate both Pride & Prejudice and North & South to the category of romantic novels and simply leave them there. Both handle issues of far-reaching social impact with delicacy, but today, let us simply sit back and admire the masterpieces who are Fitzwilliam Darcy and John Thornton. Delicious, aren’t they? What is it about these fictional characters that seems so real to us that I actually fear somewhat for my own safety in labeling them as fictional? Together, they represent two of the strongest, most iconic male characters ever conceived in literature, and, perhaps most fittingly, they were created by female authors. I believe that both Jane Austen and Elizabeth Gaskell have bestowed on us far more than a few hours of entertaining reading. They have crafted paragons of imperfection- men already possessing honor and dignity, but lacking the requisite social skills and humility to win the objects of their hearts’ desires. Both must travel a very hard path, and in the process, they reveal to us some of the secrets of love and humanity. Darcy, as we all know, is wealthy and powerful, the master of his own destiny at a young age, but all that prestige has come at a steep price. He has lost both of his parents, and must now manage his sprawling estate without the continued advice of his father. Everyone has a plan for his life, and so far, he has fallen into step just as he was expected to… but it chafes. He is mortified by all the women seeking his attention, and clearly has never been impressed by any. Though Austen is silent on this point, one begins to think that he would eventually have done his duty and married the least embarrassing and most convenient debutante at hand, simply to secure the required heir. He is certainly taking his time about doing it- perhaps not yet ready to completely fill his father’s shoes? Or could he be searching for something he cannot accurately describe, and has never yet encountered? However, he has his hands full enough without the bother of searching for a wife. In addition to all the expectations on him, he has been betrayed by one he used to consider a friend, and his own sister threw off his protection and put herself in harm’s way. It is a wonder the man is not gray by the time Elizabeth Bennet meets him. Thornton has also lost his father, in a betrayal that will color all his future relationships with a deep, hidden sense of unworthiness. He spends the next sixteen years trying to bury that shame but has no time to admit that fact, because somewhere in his early adolescence, he had suddenly become the sole provider and head of the family. Thornton has neither the luxury nor the burden of a fortune and a great estate dumped into his lap. Rather, he contends with the family’s disgrace over his father’s suicide and debts, and one imagines that the boy never has a chance to properly mourn his lost father. He is driven by both pride and ambition, and devotes all his energies to raising his family from poverty to prosperity. This, I think, is where Thornton really stands out. Gaskell gives us hints that Mrs Thornton had once come from good family, but their change in circumstances at George Thornton’s death is not one which was easily reversed. The hard-working young John Thornton, however, defies the odds. Unfortunately, he has learned to measure his worth by what he has achieved. By the time he meets Margaret Hale, he has become well-regarded and wealthy, and is starting to think that maybe, just maybe, he might finally have earned the right to be loved. I find it interesting that both men have been forced into a position of authority at a young age by the loss of their fathers. Both also find themselves responsible for their younger sisters, who give evidence that the gravity of life’s experiences has been quite masterfully spared them- perhaps to their detriment. Both men have at last come to a place where they feel comfortably in control of their fortunes, despite their own looming worries about traitorous friends or pending labor strikes. Both, however, are deeply private men, and likely very lonely men, ripe for overpowering infatuations with women who might be their intellectual equals. Darcy has no intentions of finding any woman appealing in that crowded country dance. There are none of his social sphere- hard as Caroline Bingley tries to persuade him otherwise. No woman in that room is even a candidate for the title of Mrs Darcy, until one walks away from him. Over their first several encounters, Darcy is repeatedly fascinated by this woman who seems not to be in pursuit of his purse, and who possesses the wit to close his mouth on more than one occasion. Elizabeth stands out not because she makes an effort to, but because her very nature is in such stark contrast to everything he has already grown weary of. He cannot help watching her, and learns that she is generous, ladylike, and well-read- all qualities which he admires. She is also devastatingly clever, and will not suffer insults in silence. He grows to respect her able, poised defense of herself, but her sparkling good humor and genuine zest for life may be the final blow to his denial of feelings for her. She is everything he lacks, and unlike anything he has ever seen, but oh, her family! The world is not fair. Thornton is a tradesman- a manufacturer, lest we overlook that distinction- and as such, his society is not considered worthy of many of the gentry. Milton, however, is his own particular little kingdom, and here, the manufacturers reign. 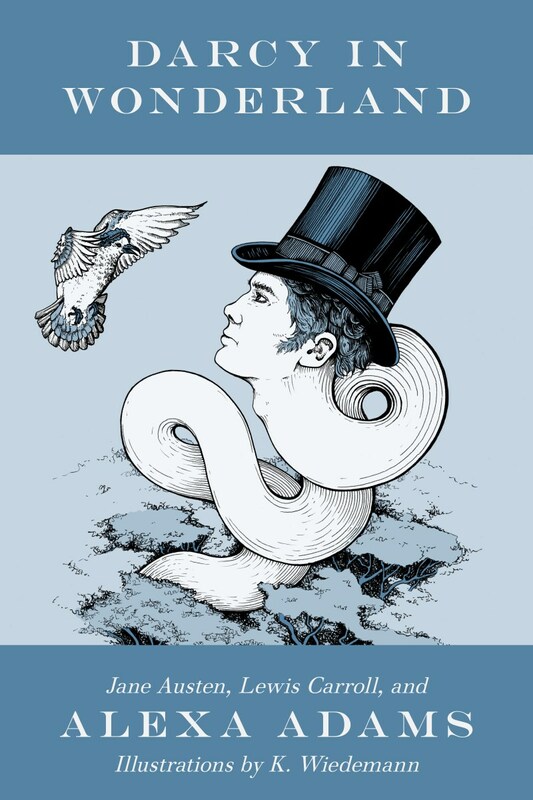 There is some confusion about whether he, a man of resources and authority, is on lesser, equal, or greater footing than the penniless gentlewoman he encounters. He is used to having his way, but Margaret coolly puts him in his place at their first meeting (which is different in the book, as Trudy Brasure’s post explains beautifully). She is clearly not intimidated by him, demanding his respect immediately, but he is well and truly gobsmacked by her grace and beauty. He becomes rather tongue-tied in her presence, which must surely be a new experience for him, and does little to impress her. She represents everything that he has long been working for- she is elegance, serenity, and gracious ease; the very living evidence of the kind of security he has been longing to provide and at last thinks he might have earned. Throughout their early acquaintance she challenges his opinions, and though naïve, her intelligence inspires him to desire her respect. He tries to earn it, but the harder he tries, the more she scorns him. Thornton’s mother claims that other women were interested in him, but apparently he has never bothered with them. One wonders if his early experiences learning at the knees of his strong, determined mother might have taught him exactly what sort of woman was worthy of his regard. Unfortunately, he can sense from the beginning of their acquaintance that Margaret considers him unworthy of hers. This haughty Southern maid both repels and captivates him, and he spends each encounter bouncing between indignation and breathless adoration. So, here we have two men who are ostensibly great catches for a marriage-minded young lady, but have proven rather elusive. The authoresses leave the readers to conclude that their heroes cannot be satisfied by a marriage of convenience, and that it will take a remarkable woman to jar them from their complacency. These women turn out to be somewhat unconventional, intelligent, and possessed of rather unique charms which manifest as astonishing beauty in the eyes of their enraptured beholders. Their attractions are on every level- physical, emotional, intellectual, and in Thornton’s case, even spiritual. 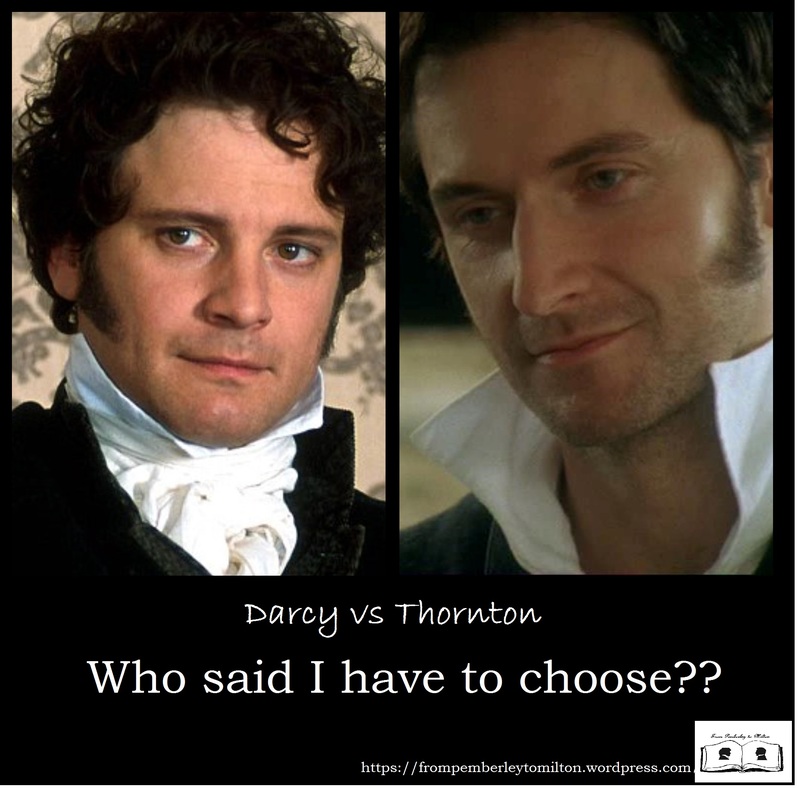 In both cases, our gentlemen fight tooth and nail not to succumb- in the first case to a woman beneath Darcy’s notice, and in the second to a woman who considers Thornton beneath hers. It has been said that in North & South, the Pride was Margaret’s, and the Prejudice was Thornton’s. That observation is, perhaps, not at all inaccurate. 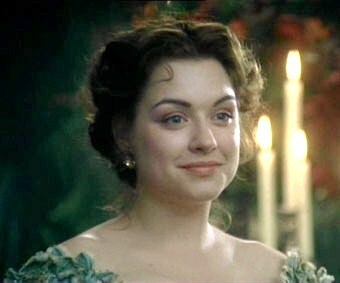 When Darcy finally overcomes all his own objections to Elizabeth’s connections, he anticipates that she will accept him immediately. Oh, Darcy. Many a treatise has eloquently detailed why he never expected a refusal, but refuse him she does- mercilessly and jaw-droppingly. In apologizing for the delay in his confession of love, he manages to offend her so thoroughly that she clubs him over the head with a verbal ton of bricks before he escapes the parsonage that day. Ouch. Never has Mr In Control of the World been so humbled. She is wrong, entirely wrong, about everything! Isn’t she? Surely, a nice, civil letter will help clear things up. He scurries back to London with his tail between his legs, but at the very least, hopefully he has put to rights some of her misapprehensions. Sadly for poor Mr Darcy’s wounded pride, he is forced to admit that the only woman he has ever wished to impress also happens to be the only woman to see him for what he truly is- a man of too much conceit for his own good. Thornton, in his more rational moments, knows very well that Margaret would never have him. Unfortunately, his judgement becomes a little hazy whenever he is around her, and for some while he has been privately watching her and fantasizing about her. All it would take to set off the powder keg of his growing passion is a simple sign from her that she might not despise him. When she feels compelled to shield him from his own workers, believing that her femininity provides her a natural, sacrosanct safeguard of sorts, she does so without considering what he might think of her motives, and with just as much pity on the workers as on the unprotected Thornton. Thus, when he shows up at her door the next day to thank her and to do what he considers his duty as a gentleman, she righteously slaps him down. The ensuing argument is glorious and deliciously highlights the stark contrasts in their ways of thinking. Thornton goes away heartbroken, but vowing to love her still. Margaret feels as though her innocence and dignity have been stripped away because her lofty motives have been mistaken for something so vulgar as affection for a man she does not like. Really, she doesn’t like him. At all. Oh, the misunderstandings! The reader can see clearly from the beginning that the characters would complement each other in ways which even they do not yet fully comprehend, but those ladies are having none of it. Elizabeth is offended that Mr Darcy thinks he can insult with impunity, and still believe he is doing her a favor by offering his hand. Money cannot buy this girl, which we cannot help but admire, even though at the same time we shake our heads at her stubbornness. Mr Thornton and Margaret’s argument is subtler. Margaret has never really come to terms with her own feminine maturity or the fact that she might be an object of desire. She is scandalized that Thornton could think she wished to protect him personally, finding such an emotion abhorrent to her maidenly sensibilities. She later confesses to herself that there was something of a spark there, else how could she have found such courage in the face of danger? Mostly, however, she feels that she acted out of sacrificial honor despite her personal feelings, and she certainly does not need him messing things up by claiming love for her. In addition, marrying Thornton for the security he might offer rankles, because in her mind, he is a giant social step beneath her, and in effect, she would appear to be marrying him for improper reasons. Austen never gives us any indication that Darcy confessed his failed proposal to anyone. Plenty of authors have since toyed with that entertaining notion, but in the original, Darcy keeps his stiff upper lip and goes back to the business of living without Elizabeth Bennet. Apparently he is not doing a very good job of it, because at their next encounter, he is anything but composed. He sees at once that his letter has improved her view of him somewhat, and almost immediately he sets out to win her good opinion once more. Things might have continued rather swimmingly, until Wickham decided to take a holiday with Elizabeth’s younger sister. Darcy’s subsequent actions are why we all love him. He patches it all up and saves the day, but he doesn’t want Elizabeth to know about it. He doesn’t want her gratitude, because he senses that along with it might come a feeling of obligation, and eventually, resentment. He does want to restore her family’s dignity with a minimal amount of fanfare, so he goes about it quietly. He sets out on his mission knowing that she may forever be beyond his reach. Thornton tries to go on with life too, but only after assuring himself that there is no other woman out there to equal the one he has lost. He refuses to allow his mother to abuse Margaret in his hearing, immediately taking upon himself the blame for her refusal. Clearly, he was not worthy, and he knew it beforehand. Slowly, Milton goes back to “normal” after the strikes, but Thornton has a new outlook on his business. Margaret has held a mirror to his face, and he does not like what he saw there. As he is processing his new ideas, he discovers Margaret in a compromising situation. Though he believes her lost to him and devoted to another, he steps in to save her from legal troubles because he cannot bear to see her come to harm. His involvement is both a blessing and a curse, for now Margaret sees his inherent goodness, but his knowledge of her own personal fall from grace drives yet another rift between them. The modern audience is more caught up in Thornton’s misapprehension regarding the identity of Margaret’s companion at the train station that evening. 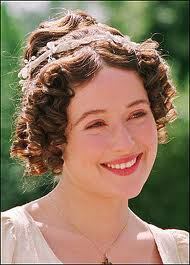 Thornton naturally takes the man to be Margaret’s suitor, when, in fact, he was her embattled brother. This shakes Thornton and leaves him sick with jealousy, but the real damage to his regard comes when she lies about her presence at the station. He had been used to at least respecting Margaret’s nobility- which, incidentally, is the very virtue she claimed to hold over him at his failed proposal. Watching her trade her integrity for the sake of concealing that mysterious other man becomes an ongoing source of agony for him. Unbeknownst to our favorite fellows, their fair maidens are both tormented with regret by now. Darcy and Thornton have begun to show themselves as men of purest honor, too good to behave resentfully when they had every right to. We want to shake them all- force them into the same room, bolt the door, and refuse to let them out until they have talked things through. Of course, that is not the way of the world, and by this point, we have four very anguished souls pining for the ones who got away. For the ladies to go to them and apologize for their grievous errors would be the vilest display of immodesty, and both Elizabeth and Margaret are feeling as though they have already sunk low enough in their loves’ eyes. Darcy and Thornton, for their parts, are quite simply too terrified to try again. They have learned the hard way that they were not all that they had considered themselves to be, and their new humility prevents them from reaching out at a number of points. Seeing Elizabeth and her family returned to respectability is possibly all Darcy can hope for. At least he settles the matter knowing that she is safe, and that he has done what he can to secure the family’s future. Elizabeth has the option again to marry, with her prospects no less limited than they had been before. In other words, she is now freed up to find someone else. In another attempt to right his own wrongs, Darcy encourages Bingley to return, and even attends his friend… you know, just to assure himself that he has done right by Bingley and Jane. Really, that’s all. Most distressingly for poor Darcy, he has no idea if Elizabeth is happy to receive him, or wishes him on another continent. Our shy hero goes back to staring at her and making her uncomfortable again. Darcy, Darcy…. Unfortunately for poor Thornton, Margaret is the least of his troubles. The month-long strike disrupted the flow of commerce in Milton so badly that nearly all the businesses are suffering. Thornton is behind on orders and income. Where once his mill had shown tremendous promise, now he is struggling for capital. Blow after blow then falls- he loses his only true friend, Mr Hale. As a consequence, the woman whose very presence in Milton is both inspiration and misery for him removes to London. He has lost all connection to her, until, most humiliatingly, Mr Bell also dies and leaves Margaret his heir. The penniless woman who had disdained him before now becomes his wealthy land lady, and has even more reason to look down on him. Thornton is at length faced with the prospect of confessing to her that he must give up his lease, but at least by this time he has learned the truth about her brother. Sorry that he has misjudged her, and knowing there is little chance for reconciliation, he makes the humbling journey to London where he will permanently sever ties with her. The darkest chapters of the books are where our gentlemen shine the brightest. This is love as it was meant to be- putting aside one’s own interests to look after the welfare of another. Not only have they proved that they never were the heartless malefactors that their fair ladies had once taken them for, but they have also made tremendous strides to improve their already honourable characters. Both feel they owe it to their own sense of dignity to become the man their lady deserves, although both have by now given up hope. By stepping in and saving their ladies from disgrace at the hands of an imprudent relative, each might have had an opportunity to collect on her gratitude, but they refuse to stoop to that level. They do not stop there, though. Each makes a meek “final” journey from the North to see their lady one last time, setting right their affairs. It is likely that each bore a spark of hope, but it was not a strong one. Well, we all know how a proper story must end, but in both cases, the final reconciliation is positively delicious- fraught with nerve-wracking angst, and at long last, joyous surrender. Apologies and forgiveness abound, and lingering feelings of shame are washed away. I shall not detail those scenes for you- either you have not read them and I do not wish to spoil them, or you have… and I do not wish to spoil them. Let me only say that the tender passion, tempered with the excruciating restraint of the period, is simply exquisite in both cases. We have glimpses- very little ones, mind you- of the strength of the couples’ new attachments, and even little peeks into a budding sense of play as it develops. It is a travesty long lamented that neither authoress returned to her story to pen a sequel- in fact, Gaskell was forced to cut hers entirely too short for our taste. We are left wanting more. And more. So what is it about those two imaginary characters that makes them, to us, the absolute definition of gentle manhood? To love, passionately and uncontrollably, is at the same time their greatest vulnerability and their most profound strength. We adore that these two men, who both thought themselves quite the masters of their own destinies, fell flat on their faces when confronted with the kind of women whom even other women can admire. We swoon over their heartbreak, gasp our approval when we see them striving to better themselves, and rejoice when their loves finally see them for who they really are. I dare not pick a favorite. Not only would my mind change as soon as I encountered yet another delightful take on one of these lovely gents, but I would likely offend the other man’s very loyal audience! I admire both so completely. It has been my privilege to borrow these characters from their original creators, continuing to torment and examine them from new angles. They are each an absolute fascination, and happy is the woman who finds her own Fitzwilliam Darcy or John Thornton. 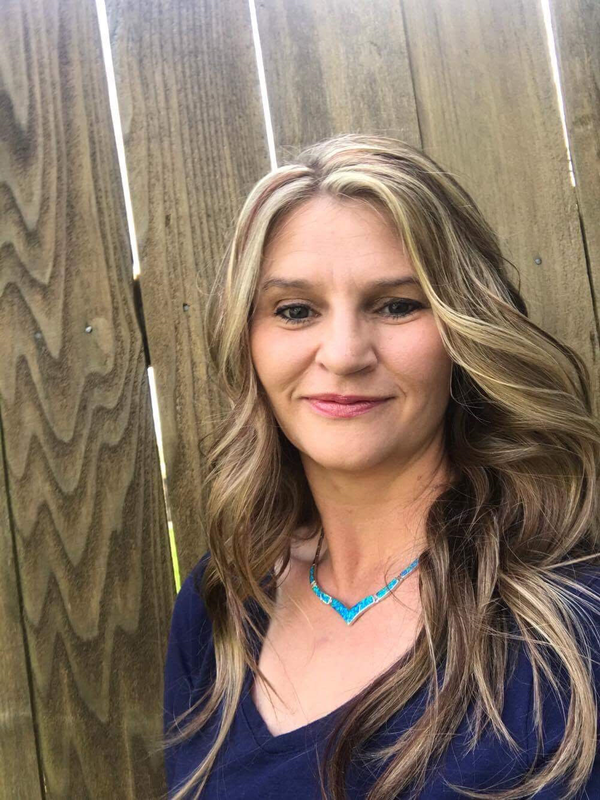 Nicole Clarkston is a book lover and a happily married mom of three. Originally from Idaho, she now lives in Oregon with her own romantic hero, several horses, and one very fat dog. She has loved crafting alternate stories and sequels since she was a child watching Disney’s Robin Hood, and is never found sitting quietly without a book of some sort. Nicole discovered Jane Austen rather by guilt in her early thirties- how does any book worm really live that long without a little P&P? She has never looked back. A year or so later, during a major house renovation project she discovered Elizabeth Gaskell and fell completely in love. Her need for more time with these characters led her to simultaneously write Rumours and Recklessness, a P&P inspired novel, and No Such Thing as Luck a N&S inspired novel which immediately became best selling books. The success she had with her first attempt at writing led her to write 3 other novels that are her pitiful homage to two authors who have so deeply inspired her. We discovered that we started our blogs in the exact same day and decided to celebrate together by offering to one of our readers a copy of The Darcy Monologues signed by the editor, Christina Boyd and 3 of its authors, Lory Lilian, Joana Starnes and Caitlin Williams. Congratulations Charlotte! Can you please send us your mailing address so that we can send you the book? You can either send it to me to ritaluzdeodato at gmail dot com, or Mira at miramagdo at yahoo dot com. Sincerest thanks to Rita for welcoming me to the blog today! It is a true joy sharing my latest novel with the From Pemberley to Milton visitors. After writing Austen’s beloved characters for over ten years now, they are as close to my heart as my flesh-and-blood friends. I can hear their voices in my head and recognize who is talking by the smallest snippet of dialogue. The trick is to convey the individual personalities in such a way that my readers know them as intimately. With this in mind, I have decided to do something different today. Rather than one long excerpt from Darcy and Elizabeth: Hope of the Future, I have chosen random bits of dialogue from assorted characters, given without any scene set-up, for a fun guessing game. I have given three choices for each dialogue set, just so it isn’t too difficult. Hopefully, even if never having read one of my novels, everyone can figure out who is talking. Who is the Character Talking? Fitzwilliam Darcy and Elizabeth Bennet will soon be joined in Holy Matrimony! The initial month of their Season of Courtship has passed. Together, the lovers strengthened their bond through honest communication, as they dealt with adversity, jealousy, and distrust. Ever growing in mutual love and understanding, a dramatic confrontation broke through the final barriers. Now their Hope of the Future “happily ever after” is assured! As long as Lady Catherine can be stopped in her scheme to interfere, that is. Or, will Mrs. Bennet’s bad advice ruin future marital felicity? Might increasing liberation lead to overwhelming passions that cannot be controlled, with catastrophe a result? 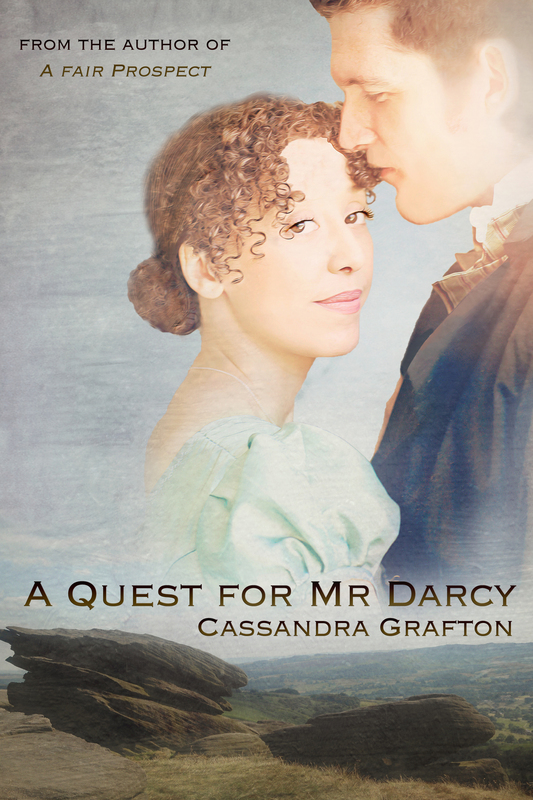 Continue the journey begun in Darcy and Elizabeth: A Season of Courtship. Delight in their flourishing romance, ride along on their escapades in London, and be a witness at the wedding of the century. The miraculous design of how Two Shall Become One begins before the sacred vows. Darcy and Elizabeth: Hope of the Future is Volume 2 of the “prequel duo” for Sharon Lathan’s Darcy Saga sequel series to Pride and Prejudice by Jane Austen. Sharon Lathan is the best-selling author of The Darcy Saga sequel series to Jane Austen’s Pride & Prejudice. Her first novel, Mr. and Mrs. Fitzwilliam Darcy: Two Shall Become One, was published in 2009. Sharon’s series of “happily ever after” for the Darcys now totals nine full-length novels and one Christmas themed novella. Darcy & Elizabeth: A Season of Courtship and Darcy & Elizabeth: Hope of the Future complete the “prequel to the sequel” duo recounting the betrothal months before the Darcy Saga began. Sharon is a native Californian relocated in 2013 to the green hills of Kentucky, where she resides with her husband of over thirty years. Retired from a thirty-year profession as a registered nurse in Neonatal Intensive Care, Sharon is pursuing her dream as a full-time writer. 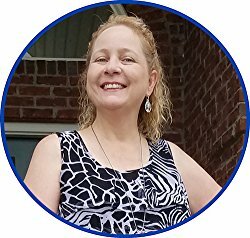 Sharon is a member of the Jane Austen Society of North America, JASNA Louisville, the Romance Writers of America (RWA), the Beau Monde chapter of the RWA, and serves as the website manager and on the board of the Louisville Romance Writers chapter of the RWA. Sharon Lathan would like to offer 3 ebook copies of Darcy & Elizabeth: Hope of the Future to my readers. Taking the “quiz” is optional but those who attempt the quiz will earn 1+ bonus point for the attempt and 1+ bonus point for each correct answer. The total points earned equal a name entry into Random.org which increases the odds of winning an eBook copy of my her newest novel 🙂 It’s a fun idea for a giveaway isn’t it? The giveaway is international and will end on the 1st of September. This month I had 2 lovely guests at From Pemberley to Milton: Alexa Adams who has recently released an Alice in Wonderland and Pride & Prejudice mash up called Darcy in Wonderland, and Regina Jeffers who has just released Mr. Darcy’s Bride(s), a new Pride & Prejudice variation where marriages are not what they were supposed to be, and where Darcy and Elizabeth meet under different circumstances than those we know from Jane Austen’s classic novel. I would like to thank these wonderful ladies for their visit, it was their first time at From Pemberley to Milton but I hope it will be the first of many. It was a great joy to have you here, so thank you very much!!! Congrats to all of you! Could you please send me your contacts to ritaluzdeodato at gmail dot com so that we can send the prizes to you? Unfortunately if I do not receive your contacts until the 31rst of August, I will have to randomly choose another winner. Regina Jeffers is an award-winning author of cozy mysteries, Austenesque sequels and retellings and vagaries, as well as Regency era romantic suspense. A teacher for thirty-nine years, Jeffers often serves as a consultant for Language Arts and Media Literacy programs. With multiple degrees, Regina has been a Time Warner Star Teacher, Columbus (OH) Teacher of the Year, and a Martha Holden Jennings Scholar. I was well aware of promissory estoppel being used in marriage issues in the United States, especially in common law marriages. For example, in Martin v. Coleman, 19 S.W.3d 757 (S.Ct Tn 2000), it states that our courts have recognized marriage by estoppel when parties have believed in the validity of their marriage and have evidenced that belief by cohabitation. [Rambeau, 212 S.W.2d at 361.] The doctrine of marriage by estoppel is applied in exceptional cases. It does not apply in cases where the parties knowingly live together in an unmarried state and are privileged to discontinue that relationship at will. [Crawford, 277 S.W.2d at 392.] And although England does recognize Promissory Estoppel, where the doctrine of promissory estoppel prevents one party from withdrawing a promise made to a second party if the latter has reasonably relied on that promise, most of the cases I found dealt with contractual law. I felt I was writing myself into a “legal” nightmare, so I abandoned the idea of promissory estoppel as part of my plot. Good old “Breach of Promise” took its place. We must remember that the Regency is an era in which marriage is pretty much forever, and engagements meant you were just as good as married-—neither person can call off without damage to his reputation, but the lady had more leeway to back out. Even so, she still risks being labeled either a jilt if she makes a habit of this. ELIZABETH BENNET is determined that she will put a stop to her mother’s plans to marry off the eldest Bennet daughter to Mr. Collins, the Longbourn heir, but a man that Mr. Bennet considers an annoying dimwit. Hence, Elizabeth disguises herself as Jane and repeats her vows to the supercilious rector as if she is her sister, thereby voiding the nuptials and saving Jane from a life of drudgery. Yet, even the “best laid plans” can often go awry. FITZWILLIAM DARCY is desperate to find a woman who will assist him in leading his sister back to Society after Georgiana’s failed elopement with Darcy’s old enemy George Wickham. He is so desperate that he agrees to Lady Catherine De Bourgh’s suggestion that Darcy marry her ladyship’s “sickly” daughter Anne. Unfortunately, as he waits for his bride to join him at the altar, he realizes he has made a terrible error in judgement, but there is no means to right the wrong without ruining his cousin’s reputation. Yet, even as he weighs his options, the touch of “Anne’s” hand upon his sends an unusual “zing” of awareness shooting up Darcy’s arm. It is only when he realizes the “zing” has arrived at the hand of a stranger, who has disrupted his nuptials, that he breathes both a sigh of relief and a groan of frustration, for the question remains: Is Darcy’s marriage to the woman legal? What if Fitzwilliam Darcy and Elizabeth Bennet met under different circumstances than those we know from Jane Austen’s classic tale: Circumstances that did not include the voices of vanity and pride and prejudice and doubt that we find in the original story? Their road to happily ever after may not, even then, be an easy one, but with the expectations of others removed from their relationship, can they learn to trust each other long enough to carve out a path to true happiness? Not the magistrate, he thought, but someone to remove her from my protection, nevertheless. Miss Elizabeth’s family has come for her. The idea did not please Darcy half as much as it should, but it was only proper to speak to the man. He had set several barristers to work today in pursuit of whether he was married to the woman or not. One of the men mentioned the possibility of Darcy’s pursuing a Promissory Estoppel case where one person makes a promise to another, but there is no enforceable contract. However, Darcy had no desire to sue the woman for the promise to “love, honor, and obey.” He simply wished to know whether he needed to approach the church courts to void his marriage. “See him up, Thacker,” he instructed. “Not unless one would consider her taking the place of my bride during my wedding an offense,” Darcy said in droll tones. “But did not Elizabeth use her sister’s name in the exchange of vows? That was her intent in foiling Collins’s marriage.” Gardiner contested. “Miss Elizabeth left her reticule at the church,” Darcy explained. Now for the GIVEAWAY: Regina Jeffers has two eBook copies of MR. DARCY’S BRIDEs available for those who comment below. To be in the mix, leave your comment by midnight GMT on Monday, August 21. Last month one of my dreams came true, I finally visited Pemberley! I went to Lyme Park, spend lots of time with wonderful people and met several writers I’ve long admired. I consider myself very lucky to have had this opportunity, so I thought that it would be nice to share my good fortune with you. I brought several books from this trip, some of them signed by the authors, and offered them to some readers. Congrats to all of you! Could you please send me your contacts to ritaluzdeodato at gmail dot com so that we can send the prizes to you? Unfortunately if I do not receive your contacts until the 26th of August, I will have to randomly other winners. Darcy in Wonderland is the proof that Alexa Adams is not afraid to try different and creative approaches in her books. She turns the unthinkable into reality and creates stories that readers will hardly forget. Darcy in Wonderland brings together the loveliness of the Darcy family and the craziness of Lewis Carrol’s Alice in Wonderland, and even though the Wonderland scenes were quite amusing, especially when Darcy was forced to go along with his daughter’s curiosity, what captivated me the most in this book was the Darcy family and their interactions. But her father is implacable and determines she has to stay, accompanied by him to guarantee she behaves of course, it’s not like he wants to escape Lady Catherine and Mrs. Bennet’s company. During the day Alice sees a White Rabbit with a Pocket Watch and chases it down a hole with her Father close behind, and this is how the adventure in Wonderland begins. In Wonderland we will find Carroll’s White Rabbit, Mad Hatter, Queen of Hearts and even some characters that will remind us of some members of the Bennet family like Mrs. Bennet, Darcy finds it very hard to understand what’s happening and where he is. His main focus is to find a way home, but Alice’s curiosity makes her want to interact with everybody and that’s what makes their journey so funny. Those who loved Alice in Wonderland will certainly love this view of the story. Darcy in Wonderland is not a romance, and readers who merely want an Elizabeth/Darcy story will not find it here, but they will find a beautiful sequel showing us how delightful their life was after they married, and how funny their household became over the years with so many different children. The relationship they established with their children is endearing, and we also have the pleasure of seeing how happy and content they are as a couple. I believe parents will particularly love this story, and they will even be able to share it with their children as this is a family book in which the drawings and the poetry add the final touch to an incredible story. Alexa Adams would like to offer one copy of Darcy in Wonderland (ebook or paperback) to one of my readers. This giveaway is international and open until the 20th of August. To participate all you have to do is comment on this post, and if you want to increase your chances of winning comment on the guest post I published yesterday. I will consider entrances from both posts. I am very pleased to receive today for the first time in From Pemberley to Milton an author whose work I have admired for a long time! Alexa Adams is not affraid to take chances to try diferente approaches in JAFF, she captivated me with The Madness of Mr. Darcy, which was a bold move, and now she surprised me once more with the release of Darcy in Wonderland, a mash up between Pride & Prejudice and Alice in Wonderland. Thank you so much, Rita, for hosting me today. It’s a pleasure to be here. In Darcy in Wonderland, Alice Darcy is a creature of two worlds, being both Lewis Carroll’s creation and the youngest daughter of Pemberley. Of course, Carroll’s character provided a great deal of guidance for how she would behave, even in a more orderly setting, but as a mother of a rather curious and fantastically imaginative six-year-old, my own daughter was also a huge source of inspiration. My husband, who is always the first one to read my work, was highly amused by the similarities between them, easily imagining our child getting herself into similar scrapes, but did you know that Carroll’s Alice was also modeled off of, or at least written for, a real child? Alice Pleasance Liddell (1852-1934) was the daughter of Henry Liddell, the Dean of Christ Church, Oxford from 1855 to 1891, at which point he became Vice-Chancellor of the university. Charles Dodgson (1832-1898), who wrote under the pen name Lewis Carroll, was a new lecturer of mathematics at Christ Church when the Liddell family relocated there. He met them while pursuing one of his many hobbies – photography – on a spring day in 1856, and an intimate friendship with the family quickly developed. He was particularly close with the children. At first his special friend was the eldest son, Henry, whom he took on many boating trips and picnics in the surrounding countryside along with the eldest daughter, Lorina (or Ina). When Henry departed for school, the next two daughters, Alice and Edith, became the chosen participants in these excursions. Much of the relationship between Dodgson and the Liddell family is clouded in mystery and rumor, but the origins of the Alice stories are recorded fact. On the 4th of July, 1862, Dodgson took Ina, Alice, and Edith on a picnic in the company of the Reverend Robinson Duckworth, who rowed the boat down the Thames to and from their destination. 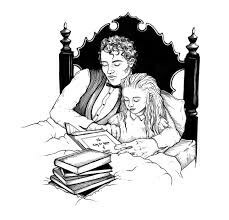 Having often regaled the girls with fantastic stories, Alice requested that Dodgson do so again, and he spun tale of a young girl named Alice and her adventures down a rabbit hole. Alice requested he write the story down, and more than two years later he presented her with the original manuscript, now at the British Library, entitled Alice’s Adventures Underground. “Or being ordered about by mice and rabbits,” Darcy added with perfect empathy. “I almost wish we had never gone down that rabbit hole!” she continued. “Curious indeed!” he snorted, causing a strong enough gust to raise Alice’s hair. “And I feel ancient,” groaned Darcy, carefully adjusting his inside arm so that it ached less acutely. Much like Austen, Dodgson did not write his first novel with the intention of publishing. It wasn’t until the story proved popular with the children of friends beyond the Liddells that he decided to pursue a wider audience. He had previously published and had some success with his poetry, so it is not surprising that the final version of the story features several playful verses, almost all parodying famous poems of the time. The mystery surrounding the Dodgson-Liddell relationship involves its sudden dissolution between the 27th to 29th of June, 1863. The page for this period is missing from Dodgson’s diary, presumably removed by either his nieces or nephew (another odd similarity to Austen, whose sister burned much of her personal writings). The Liddell’s themselves never referenced the rift. Speculations are aplenty as to what caused this abrupt break in what was hitherto a close and trusting relationship. The most sensational is that Dodgson proposed marriage to the then eleven-year-old Alice. Other the theories include Ina having developed a romantic obsession with him or his using the girls as a means to court their governess. The one thing that seems consistent is that some inappropriate romance grew amongst the players involved. Six months later, Dodgson visited the Liddell’s once more and something like peaceable relations were restored, though the same level of intimacy was never regained. Alice married a wealthy cricketer, Reginald Hargreaves, in 1880 at Westminster Abbey. She became a noted society hostess and had three sons, the second of which was named after Prince Leopold, Duke of Albany, who stood as his godfather (Leopold named his first child Alice). The two eldest of the Hargreaves died fighting in World War I. When Reginald died in 1926, Alice sold the original manuscript of Alice’s Adventures Underground for an astounding £15,400 in order to be able to afford the ongoing maintenance for Cuffnells Park, the family’s estate. She was 82 when she died. There is a very interesting film version of Alice in Wonderland from 1949 that sets the fictional story within the true tale of its creation. Few books have been so often portrayed on film, and through these movies, countless written interpretations, and theatrical versions, Alice Liddell’s fame lives on. I think it arguable that never before or since has a child’s simple request to hear a story had such a lasting impact on popular culture. Thanks again, Rita! It’s been a lot of fun. A devoted reader of Jane Austen since her childhood, Alexa Adams is the author of Darcy in Wonderland, The Madness of Mr. Darcy, Tales of Less Pride and Prejudice (First Impressions, Second Glances, and Holidays at Pemberley), Emma & Elton: Something Truly Horrid, Jane & Bingley: Something Slightly Unsettling, Becoming Mrs. Norris, and the short story collection And Who Can be in Doubt of What Followed? : The Novels of Jane Austen Continued. Alexa is an American expat living in Switzerland with her husband and daughter. She blogs about Austen and Austenesque literature at alexaadams.blogspot.com, is a contributing member of AustenAuthors.net, and a founding member of the Jane Austen Society of Switzerland. This giveaway is international and open until the 20th of August. To participate all you have to do is comment on this post and if you want to increase your chances of winning comment on the review I’m posting tomorrow. I will consider entrances from both posts.